Vinyl Digital Exclusive - Limited Edition of 300 Copies worldwide! Purple Colored Vinyl. 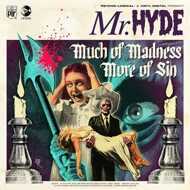 Two brand new Mr. Hyde Tracks on Necro's Psycho+Logical Records! Artwork by incredible Ink-A-Zoid!